The central nervous system consists of a central cavity surrounded by gray matter made of neuronal cell bodies and white matter made of myelinated axons. Gray matter is a major component of the central nervous system, consisting of neuronal cell bodies and other cells such as glia and dendrites. The white matter is composed of bundles of myelinated axons (few cell bodies) that connect various grey matter regions. Myelin is a thin layer, around the axons of white matter neurons and provides the white coloration. gray matter: A major component of the CNS consisting of neuronal cell bodies. The central nervous system (CNS) is comprised of white and gray matter. In the spinal cord and cerebrum gray matter is surrounded by white matter. However, in the cerebellum and cerebral hemispheres this is reversed with the grey matter surrounding underlying white matter. Gray matter is a major component of the CNS, it refers to un-myelinated neurons and other cells of the central nervous system such as glial cells and dendrites. It is present in the brain, brainstem and cerebellum, and present throughout the spinal cord. Gray matter contains most of the brain’s neuronal cell bodies. The grey matter includes regions of the brain involved in muscle control, and sensory perception such as seeing and hearing, memory, emotions, speech, decision making, and self-control. 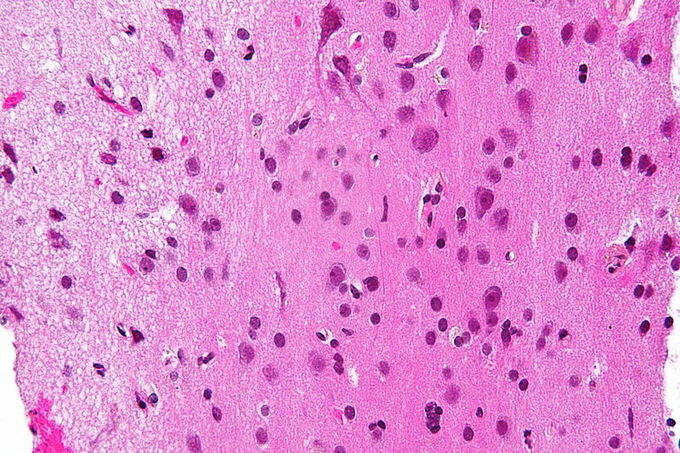 Grey and White Matter: Micrograph showing grey matter, with the characteristic neuronal cell bodies (right of image – darker pink), and white matter with its characteristic fine mesh work-like appearance (left of image – lighter pink). A second major component of the CNS is white matter. It is composed mainly of bundles of myelinated axons, with very few neuronal bodies. White matter connects the various grey matter regions of the nervous system to each other and carries nerve impulses between neurons. Myelin, the lipid that forms a thin layer, known as the myelin sheath, around the axons providing electrical insulation is white in color, giving rise to the name white matter. White Matter on an MRI: This MRI highlights the location of white matter in the brain.